On the eve of the Jewish holiday of Passover, a child traditionally asks a critical question: “Why is this night different from all other nights?” This question sets up the ritual narration of the story of Passover, when Moses led the Jews out of slavery in Egypt with a series of miraculous events (recounted in the Jewish Bible in the book of Exodus). For the last and most terrible in a series of miraculous plagues that ultimately convinced the Egyptian Pharaoh to free the Jews—the death of the first born sons of Egypt—Moses commanded the Jews to paint a red mark on their doors. In doing so, the Angel of Death “passed over” these homes and the children survived. The story of Passover—of miraculous salvation from slavery—is one that is recounted annually by many Jews at a seder, the ritual meal that marks the beginning of the holiday. The book used to tell the story of Passover around the seder table each year is a special one, known as a haggadah (haggadot, pl). The Golden Haggadah, as you might imagine given its name, is one of the most luxurious examples of these books ever created. In fact, it is one of the most luxurious examples of a medieval illuminated manuscript, regardless of use or patronage. So although the Golden Hagaddah has a practical purpose, it is also a fine work of art used to signal the wealth of its owners. A hagaddah usually includes the prayers and readings said during the meal and sometimes contained images that could have served as a sort of pictorial aid to envision the history of Passover around the table. In fact, the word “haggadah” actually means “narration” in Hebrew. The Golden Haggadah is one of the most lavishly decorated medieval Haggadot, containing 56 miniatures (small paintings) found within the manuscript. The reason it is called the “Golden” Haggadah is clear—each miniature is decorated with a brilliant gold-leaf background. As such, this manuscript would have been quite expensive to produce and was certainly owned by a wealthy Jewish family. So although many haggadot show signs of use—splashes of wine, etc.—the fine condition of this particular haggadah means that it might have served a more ceremonial purpose, intended to showcase the prosperity of this family living near Barcelona in the early fourteenth century. The fact that the Golden Haggadah was so richly illuminated is important. Although the second commandment in Judaism forbids the making of “graven images,” haggadot were often seen as education rather than religious and therefore exempt from this rule. 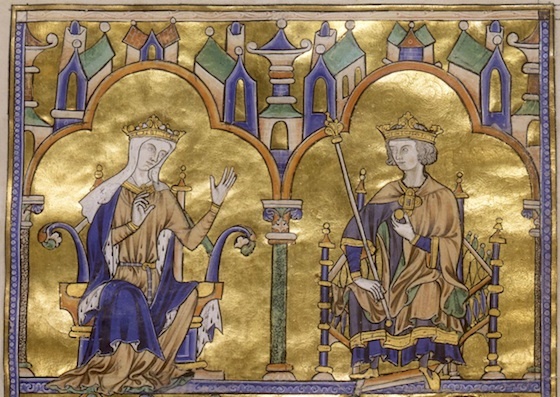 The style of the manuscript may look familiar to you—it is very similar to Christian Gothic manuscripts such as the Bible of Saint Louis (below). Look, for example, at the figure of Moses and the Pharaoh (above). He doesn’t really look like an Egyptian pharaoh at all but more like a French king. The long flowing body, small architectural details and patterned background reveal that this manuscript was created during the Gothic period. 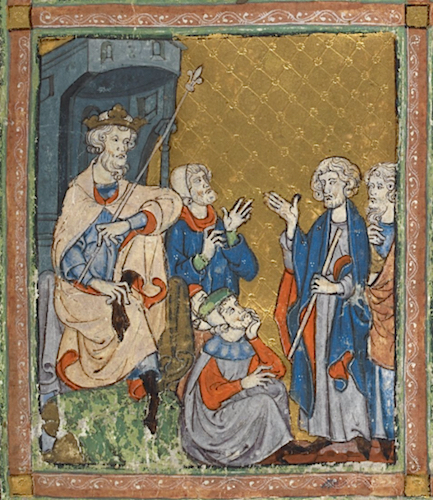 Whether the artists of the Golden Haggadah themselves were Jewish is open to debate, although it is certainly evident that regardless of their religious beliefs, the dominant style of Christian art in Europe clearly influenced the artists of this manuscript. So the Golden Haggadah is both stylistically an example of Jewish art and Gothic art. Often Christian art is associated with the Gothic style but it is important to remember that artists, regardless of faith, were exchanging ideas and techniques. In fact, while the Golden Haggadah looks Christian (Gothic) in style, other examples of Jewish manuscripts, such as the Sarajevo Haggadah, blend both Christian and Islamic influences. This cross-cultural borrowing of artistic styles happened throughout Europe, but was especially strong in medieval Spain, where Jews, Christians and Muslims lived together for many centuries. Despite periods of persecution, the Jews of Spain, known as Sephardic Jews, developed a rich culture of Judaism on the Iberian Peninsula. The Golden Haggadah thus stands as a testament to the impact and significance of Jewish culture in medieval Spain—and the rich multicultural atmosphere of that produced such a magnificent manuscript. Beṣalel Narkiss, The Golden Haggadah A Fourteenth-Century Illuminated Hebrew Manuscript in the British Museum (London: Eugrammia Press, 1970). Marc Michael Epstein, The Medieval Haggadah: Art, Narrative, and Religious Imagination (New Haven: Yale University Press, 2011). Katrin Kogman-Appel, “Coping with Christian Pictorial Sources: What Did Jewish Miniaturists Not Paint?” Speculum, 75 (2000), pp. 816-58. Katrin Kogman-Appel, Illuminated Haggadot from Medieval Spain. Biblical Imagery and the Passover Holiday (University Park: Pennsylvania State University Press, 2006). Katrin Kogman-Appel, Jewish Book Art Between Islam and Christianity: the Decoration of Hebrew Bibles in Medieval Spain (Lieden: Brill, 2004), pp. 179-85. 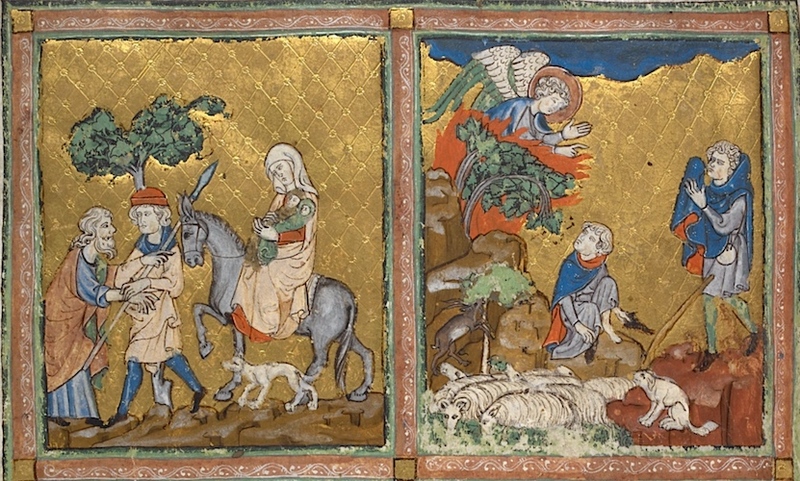 Julie Harris, “Polemical Images in the Golden Haggadah (British Library Add. MS 27210),” Medieval Encounters, 8 (2002), pp. 105-22. Cite this page as: Dr. Elisa Foster, "The Golden Haggadah," in Smarthistory, August 8, 2015, accessed April 21, 2019, https://smarthistory.org/the-golden-haggadah/.